By 1939, many in New Zealand had begun to accept the cultural equality of the native Maori people with the pakeha (white European) settler culture. As war seemed to be approaching in the summer of 1939, two Maori members of the New Zealand Parliament made a public demand that any military expeditionary force sent abroad include a distinctive Maori combat unit. A Maori Pioneer Battalion had served with the New Zealand Expeditionary Force in France in the First World War, but the political thought of the 1930s and 1940s said combat service was a necessary measure of racial equality. On 4 October 1939, a month after New Zealand declared war on Germany, the government announced it would form a distinctively Maori infantry battalion. The enlisted personnel would be ethnic Maoris, but the government reserved the right to appoint pakeha officers. Though this provision proved unpopular with Maori leaders, signs that the government and army were actively seeking Maori officer candidates to train and promote eased the protests somewhat. And the Maori unit became especially popular after one of the new recruits, Pvt. Anania Amohau, wrote a marching song for the battalion and introduced the haka, or preparatory war dance. 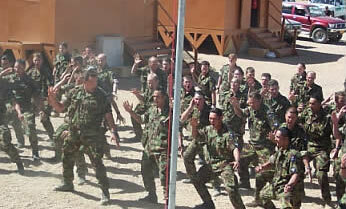 The haka became a distinctive feature not only of the Maori Battalion but eventually of the entire New Zealand Army and its international sports teams. And the government kept its promise; every battalion commander after the first was at least partly Maori. Maori soldiers had a very pronounced habit of acquiring automatic weapons from multiple sources: abandoned on the battlefield, taken off enemy prisoners or the dead, or “borrowed” from other units. This is not an unusual situation: During wartime many soldiers of all nationalities acquire additional pieces of equipment. What made the Maori unique was the sheer scale of their acquisitions, and the reluctance of higher authority to take their toys away. After one bad experience in handing over their extra weapons for “inventory,” the Maori never again yielded up their gear. It appears that New Zealand officers did not want to anger the warriors, and in the official record there’s an unstated implication that the Maori would have played the race card over this issue in Parliament back home. Maori also had a reputation for excellence in fighting with knives or bare hands, and for skill in close-quarter action. Whether they were any better than other ANZACs (no mean brawlers themselves) is open to debate. Throughout the war, all Maori were volunteers. 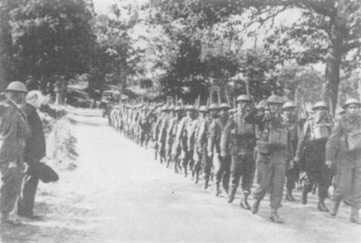 The battalion’s four companies were organized by tribal affiliation, and gathered on North Island for several months of training before embarking for England on 1 May 1940. After eight months of training there, the battalion and the rest of the division went to Egypt and on to Greece as soon as they arrived. The Maori saw their first combat on 16 April, in a series of clashes with advancing German mountain and panzer units near Mount Olympus. When the 2nd New Zealand Division evacuated Greece two weeks later, most of the battalion got off intact. Its carrier platoon had been detailed with the Divisional Cavalry and was taken prisoner at Corinth while the battalion’s Reinforcement Company was caught up in the confusion and surrendered to the Germans at Kalamata Bay. The Maoris saw much more extensive fighting during the German air landings on Crete, escaping afterwards with the rest of the division to Egypt. But their real test under fire came in Libya, when the division entered the front lines in November 1941, as part of the second echelon of Operation Crusader. Until these actions, the New Zealand command seems to have been divided over Maori fighting qualities. The inherent racism of the era made it hard for some of them to accept a unit including many non-white commissioned officers. But after the battalion’s excellent performance in Crusader, division command never again left the battalion in the rear and more than once separated it from the brigade structure for use as a shock column or special reserve. By the time of the battles around El Alamein, the Maori fighting reputation stood very high. The Maori battalion is represented by just one piece in Alamein, but it is one of the best units in the game. Most units in the game system have a morale (number on the left side of the counter) of 4; the Maori are 6. The combat rating of 8 is also quite high. The Maori accompanied the New Zealand Division across North Africa and into Italy, fighting at Monte Cassino. Their last battle came at Udine in the Italian Alps in April 1945. In January 1946, they returned to New Zealand, where Maori women sang the tangi for the dead, all had the blood of their enemies ceremonially cleansed from their souls, and the battalion ceased to exist.